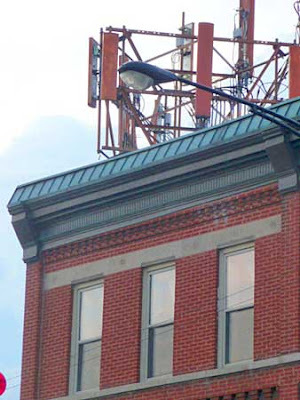 East Village Association | West Town Chicago: How's your cell-phone coverage? Cell tower atop 2002 W. Chicago Ave.
An AT&T repairman was working Mother's Day, tool belt heavy with gadgets to check land lines in the alley behind Damen Avenue. Meanwhile, Mom is getting a cell phone and we were checking the coverage. Our most reliable tool: "Can you hear me now?" Websites such as cellreception.com and mapmuse.com feature data on cell towers, but with a lot of noise: Records are incomplete, and leased towers don't disclose which carriers use them. A tower listed on Western Avenue looked more like flag streamers at a used-car lot. So the best source to gauge call quality might just be you. Leave comments on your cell-phone experience in East Village, particularly if you can weigh in on the iPhone slugfest between AT&T and Verizon.